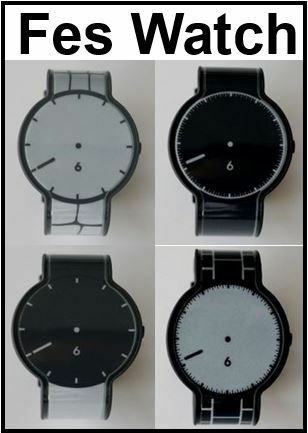 Japanese multinational giant Sony Corporation has developed a “a minimalist monochrome” e-paper watch – The Fes Watch – as part of its experimental drive towards new wearable electronic products. The e-paper watch’s battery can last for about 60 days, Sony says. Both tech and fashion experts believe that fashion will play a big part in driving the tech industry. According to Fashion Entertainments, which claims to be the creator of the Fes Watch, it is a start up company. However, the Wall Street Journal says it is a subdivision of Sony. Sony wants to use the name Fashion Entertainments initially and keep its own name in the background, until it decides whether the new fashion item has caught on with consumers. Fashion Entertainments, which insists it really is a startup, has even requested crowdfunding donations through the website Makuake. Crowdfunding is an online system of getting lots of people to donate a small amount of money each. Fashion Entertainment says it has raised ¥3.5 million ($30,000) from over 150 supporters. Donors have been told they can expect to receive their watch after May 2015. The e-paper watch has a minimalist, monochrome design, and still looks a bit like a prototype. It does not have the range of features seen in some smartwatches available today. A Sony spokesperson told the BBC that Fashion Entertainments, in fact, is a division of Sony’s New Business Creation Department.